I appreciated the fact that he disagreed with me politely. Not all have. It’s not the first nor the last time someone will make that point. It made me remember my Aunt Margaret. “Auntie Margaret,” as I always called her. She was a gracious Southern lady. My dad’s older sister. An avid reader who knew British royal history like the palm of her hand. All those Richards and Elizabeths. Mary Queen of Scots. She could talk about them as if they were cousins. She had a soft, generous laugh, which you heard frequently. She joked that, after a few months of being a mom, she could “change a diaper with one hand and eat a ham sandwich with the other.” Introduced me to the satiny voice of Tony Bennett. Hated people ending sentences with prepositions. 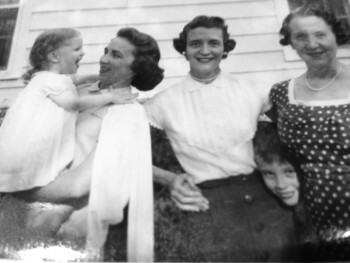 Me, my mother, Aunt Margaret and Grandmother. The original photobomber is brother Adam. My phone would ring. “Maw-gret?” With the “Maw” delicately molded into 2 syllables. Her accent was one of her charms. She was no stranger to grief. Her father had died from a massive heart attack the night before her wedding. At age 64, she was diagnosed with lung cancer. She was not a smoker. She fought it but didn’t win. She lived to know that her beloved daughter had had a baby. That daughter and new child arrived at her bedside a little more than an hour after her death. I had never seen my father cry. Until then. They had adored each other. I had gone to see her a few months before. She dressed most days that she felt like it. No longer was she receiving treatment. Just medicine for pain. “Will you please sit down and tell me what’s really going on in your life?” she asked. There was just a hint of irritation in her voice. Not much. “Of course I will,” I replied immediately. Her eyes softened a bit. “What they don’t talk about are the joys in their lives. Or the horrible things either. I guess they feel that nothing could be worse than knowing you are dying. And how can they be happy, even excited about something in the future, when they are talking to me?” She sighed, smiling gently. This was long before any thought of being a psychologist had entered my head. I did what I knew how to do. About the divorce I was going through. About my fears. About funny stuff. Whatever had been in my power to do for this woman I loved so much, I would have done. I have never forgotten the conversation. Grief. Sometimes when yours is at its worst, is acute, you cannot tolerate hearing about others. That is understandable. Human. 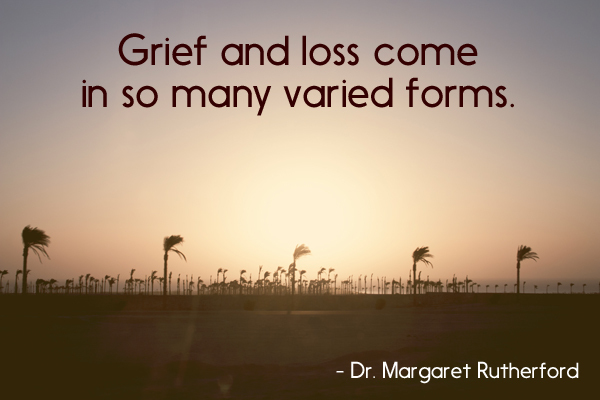 But grief and loss come in so many varied forms. Having a broken leg is difficult. Sometimes it mends well. Sometimes it does not. Being paraplegic? A whole different journey. I don’t think it’s helpful, or necessary to compare. Auntie Margaret knew that. She was coping day by day. It did not overshadow her desire to help others with their own complex lives. It didn’t prevent her from knowing there are levels of loss. Of pain. Just like there are levels of happiness and joy. It is one thing, and a healthy thing, to count your blessings. To live in the “glass half full” most of the time. To have perspective on your problems, especially if you know someone whose mental, emotional or physical battle is immense. To have empathy for them. To allow their courage to be inspirational for you. It’s just not required that you discount your own. If you’ve been supported and loved by someone through your grief, you might want to thank them in a small way. Click here for “Marriage Is Not For Chickens,” a gift book by Dr. Margaret!